It’s Official: Savages is the Business! Savages has beaten off four other nominees to win Best Established Business at Didcot First’s 2017 Business & Community Awards. 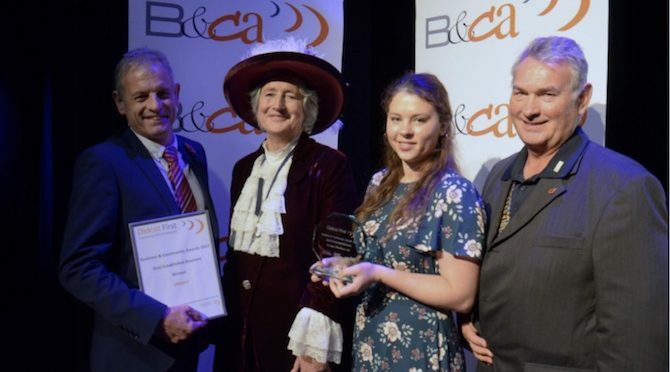 Commenting on the award, which recognises and rewards excellence amongst local businesses, community groups and young enterprise, the Blewbury-based company told the Bulletin that it is ‘delighted’. 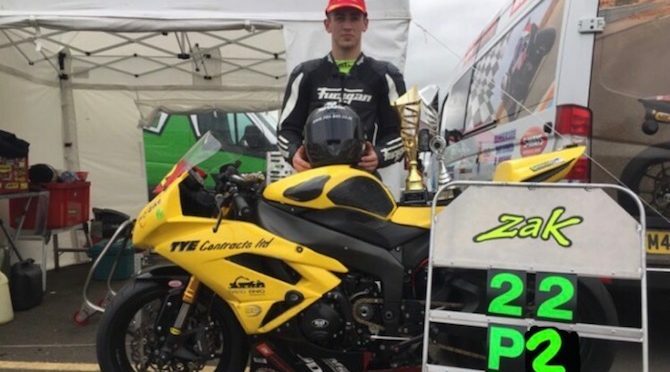 Blewbury’s Zak Corderoy, 18, has just completed his rookie year on his ZX6R , coming second in the TSGB Elite 600 Championship. We are excited for 2018 as Zak will be entering into the BSB paddock to compete in the Pirelli National Superstock 600 class as he will be racing against Europe’s fastest. Everyone at Zak Corderoy Racing would like to thank family, friends and sponsors for their continued support. Robert Long: Our ‘Unsung Hero’ now ‘Sung’! 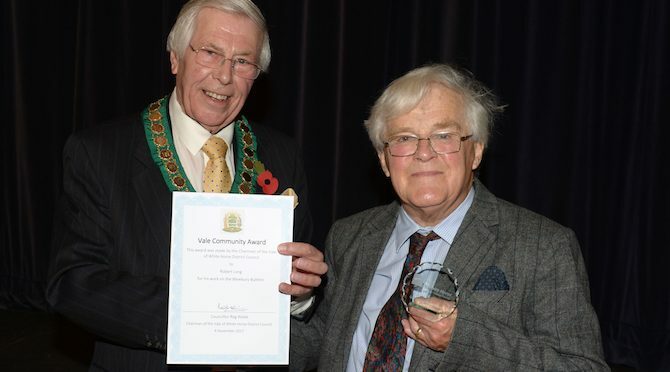 There was a very happy ceremony including a lunch at the Beacon in Wantage when many volunteers from all over the Vale were presented with certificates by Reg Waite, Chair of the Vale District Council, recording their work for the community. There was an astonishing range of achievements, including community shops, cricket and youth clubs, council work. In fact, think of almost anything people might do at a local level to improve life in some way and there was someone there. Blewbury was represented by Robert Long for his 30+ years with the Bulletin, first helping Roger Cambray and then editing it for nearly 20 years. Also at the ceremony was Rosemary Tilden who is one of the longest serving people who do the task of putting the Bulletin together every month. Robert (and Audrey) wish to thank the Parish Council and all who nominated Robert for this award. They have happy memories of the collating evenings and the chat that goes on there. It’s where, to quote one of the collaters, “You get a better class of insults”. They would like to record their thanks to all the people who help with the Bulletin, the contributers, editorial staff, collaters and the distributers who go out in all weathers to deliver it to you through the door. Long may it continue! This Winter Sustainable Blewbury’s hedge-laying group plan to lay hedges along Pound Furlong Lane and in Tickers Folly Field. With a large programme of work ahead of us, the group would very much welcome new members who wish to learn the skills and help to maintain and improve Blewbury’s hedges. The first task is to coppice (cut) the hazel stakes and binders which are needed for the final stages and we plan to do this on 26th November, starting at 9.00. If you would like to join us then please contact Alex or John and we will advise on where and when to meet and what to wear. After that the actual hedge-laying will start in early December. 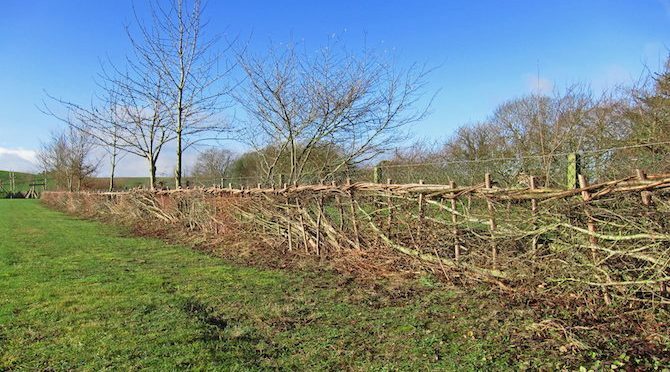 Hedge-laying is a traditional craft which has the benefit of strengthening and improving hedges and providing a much improved habitat for wildlife.